You’re sick of hearing about it already, right? 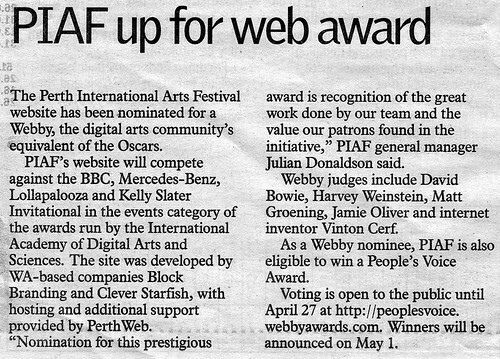 Well, voting closes this Friday (you HAVE already voted, HAVEN’T YOU) so soon I’ll have no choice but to shut up about the Perth Festival web site and our Webby Award nomination. ahem. 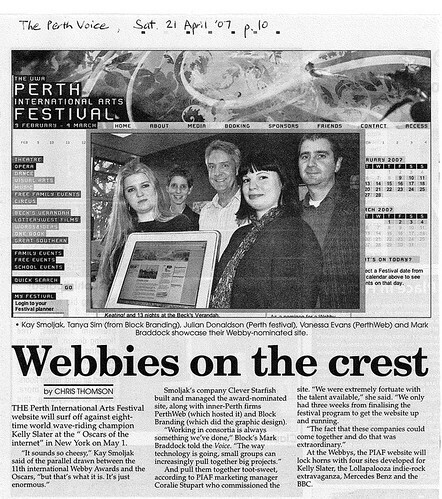 Anyway, we made it into the newspapers… a small piece in the Arts section of Wednesday’s West (thanks to Ben for spotting it, and Al for rescuing a copy from the cat’s litter tray for me), and the a mini “feature” in the Perth Voice, complete with picture. I had to hunt to track down a copy of the Perth Voice – finally found one in a newsagent in Leederville. I joked that the paper was so obscure that no one would even see it, but then later that night we saw Paul, and he announced that he’s seen me in his local paper. Remember… voting closes this Friday. We’re in Websites > Living > Events. Sign up here! ~ by goatlady on April 23, 2007.